Insects are a major problem in cranberry production – they are estimated to reduce yield by 1-2% and without spraying, cranberry false blossom, a phytoplasma vectored by blunt-nosed leafhopper, would eliminate commercial cranberry production completely. Spraying chemical pesticides is the most common practice to combat pathogens and herbivorous insects, but beneficial insects, such as honeybees, important pollinators of cranberry, and natural enemies, such as predators and parasitoids, could be affected as well. Therefore, at the P.E. 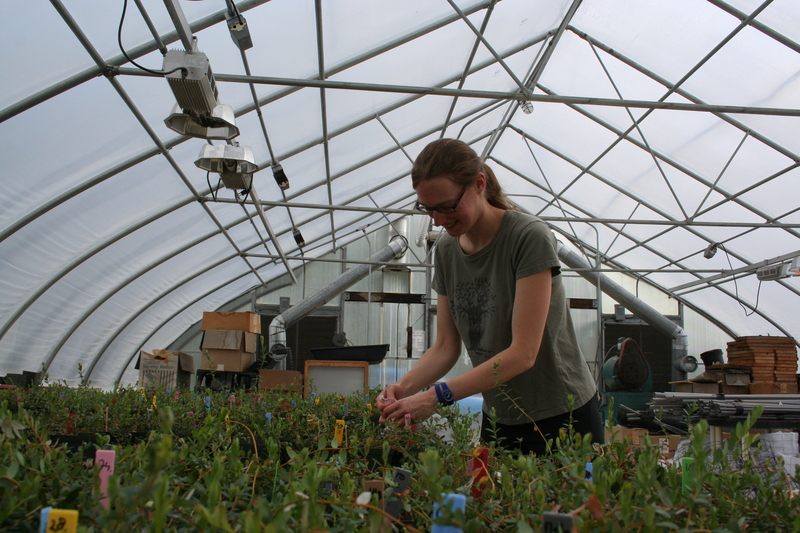 Marucci Center for Blueberry and Cranberry Research and Extension, we study the defensive mechanisms that cranberry plants themselves use against insect feeding. The research project of Dr. Elvira de Lange, a postdoc at the P.E. Marucci Center, focuses on four of the most problematic insects on cranberry in New Jersey: Sparganothis fruitworm, spotted fireworm, gypsy moth and the above-mentioned blunt-nosed leafhopper. In the field, Elvira has studied resistance of cranberry uprights and fruits to Sparganothis fruitworm and spotted fireworm. In an experimental bog with ten cranberry varieties – Howes, Early Black, Ben Lear, Stevens, #35, Grygleski, HyRed, Crimson Queen, DeMoranville and Mullica Queen – she put out a large number of cages, in which larvae of the two insect species were introduced. The larvae were weighted before and after feeding on the plants, enabling the identification of varieties on which the insects grew best – more susceptible varieties – and on which they grew poorly – more resistant varieties. In the greenhouse, Elvira has assessed resistance of seven cranberry varieties – Howes, Early Black, Potter, Stevens, Franklin, Crimson Queen and DeMoranville – to gypsy moth. She weighted larvae before and 7 days after feeding on the different cranberry plants, to evaluate their performance. Also, she collected the volatiles or aromas that gypsy moth-infested plants emit. A similar experiment was performed with blunt-nosed leafhopper. Elvira evaluated the growth and development of leafhopper nymphs on six cranberry varieties – Howes, Early Black, Potter, Franklin, Crimson Queen and DeMoranville. She selected small nymphs of approximately the same size, allowed them to feed on the plants in small cages, and evaluated their weight and developmental stage – nymph or adult – 20 days later. In addition, she collected the aromas that leafhopper-attacked plants, variety Mullica Queen, emit. Herbivore-induced aromas may be beneficial for the emitting plants, as they can serve to repel herbivores and attract their natural enemies. But they may also be detrimental, as they can guide other herbivorous insects to the plants. Elvira aims to identify specific compounds in the cranberry aroma that are correlated with plant resistance against various pests. This information may help to reduce insect damage in the cranberry crop. Dr. Cesar Rodriguez-Saona, Associate Professor at the P.E. Marucci Center, has previously identified differences in cranberry resistance against insects as a result of plant nutrient status. Recently, Dr. James Polashock, Research Plant Pathologist at the USDA-ARS and located at the P.E. Marucci Center, reported that thrips seem to attack plants in large numbers right after fertilization treatment. Therefore, the question arose if cranberry plants that have access to abundant nutrients emit aromas that attract herbivorous insects. Elvira subjected six cranberry varieties – Howes, Early Black, Potter, Stevens, Franklin and Crimson Queen – to four different nutrient levels and collected plant volatiles. Eventually, she aims to assess the attractiveness of these volatile blends to herbivorous insects and their natural enemies. Elucidating mechanisms of resistance against insect pests in cranberries will help improve insect resistance in existing high yielding varieties, as well as development of novel varieties with improved resistance qualities. Elvira would like to thank technicians Rob Holdcraft and Vera Kyryczenko-Roth, as well as the summer students in 2014 and 2015, for assistance with the experiments. Funding was provided by the New Jersey Cranberry Research Council Inc., Cranberry Institute, Cape Cod Cranberry Growers Association, Canadian Cranberry Growers Coalition, and Ocean Spray Cranberries, Inc.